Select Credits: I'm primarily a director. Most recently I directed a new show called The Private Sector at Theater for the New City. I've also directed a handful of shows at Yale, many of them original (including both Cow Play and The Private Sector as well as Bunkerville: A Post-Apocalyptic Musical). Why theater? : It creates a scenario where a group of people experience something together that no one else can ever have exactly. A live audience is one of the most powerful ways that people can connect in my opinion. Obviously the show itself is incredibly important, but what's most exciting is how the show can effect an audience as a whole. It's the same reason I like going to concerts. It's a chance for people to bond in a unique way. 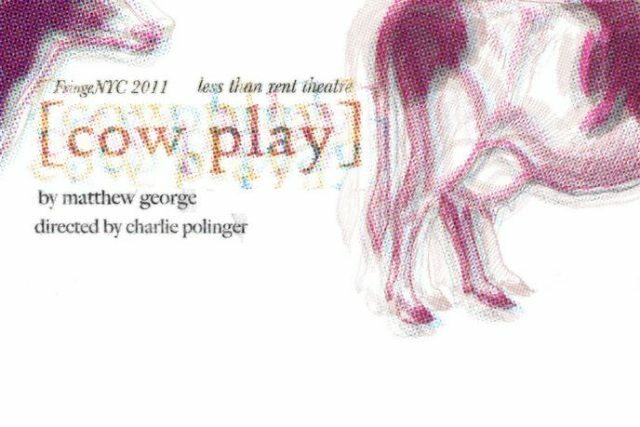 Tell us about Cow Play: Cow Play is very difficult to describe both because it is very non-traditional and poetic (a bit like Sarah Ruhl's plays) and because I don't want to give too much away. It's about these two brothers who grew up on a dairy farm, Jed and Mark, who grow apart after their father dies. 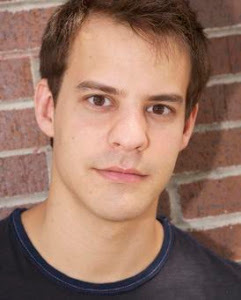 Mark goes to college and gets a girlfriend, Julie, while Jed takes over the farm. But eventually Julie needs to get out of the city so Mark takes her home to the farm, and that's where the majority of the play occurs as all three of their relationships develop. More generally, though, it's about how people deal with time. Time is such a bizarre and horrifying idea for people to grasp, mainly because it moves forward at its own rate and there's nothing anyone can really do to stop it. So the show experiments with time, weaving the past, future, and present together to demonstrate how difficult it is separate those things. What is it like to be a part of Cow Play? : I'm having the time of my life with this show. I directed a production of it last September at Yale and that was an amazing experience, but it ended too soon. It's such a challenging, delicate, and visually specific show that it's pretty much a dream for director, actor, and designer alike. But it's really fun revisiting it having done it before. We're constantly finding new things to play with and it's great collaborating with Matthew (the playwright). We've gotten to the point where we can really bounce ideas off of each other to help find the strongest ways to present things. What kind of theater speaks to you? What or who inspires you as an artist? : This sort of ties into the "why theater" question. I'm inspired by theater that is created around the fact that theater is rare because it's made for a live audience, unlike film. I like theater that uses it's liveness to its advantage. I honestly think theater is on its way to making a comeback because the fact that everything is so accessible (on youtube, itunes, etc) makes live entertainment way more exciting and special. I think people like Sarah Ruhl, Sam Shepard, Tony Kushner (and MANY others of course) are so inspiring because they tap into the most theatrical and visceral ways to tell a story, and that's what it's all about. What’s it like to be a part of FringeNYC? : It's like going on the Superman ride at Six Flags. It's horrifying to prepare for, but once your on it, it's awesome and scary and fast. Or, without using a stupid metaphor, it's just exciting. It definitely comes with a lot of limitations, but that's half the fun and it's really great being a part of a larger whole and seeing what kinds of things everyone else is doing. What show have you recommended to your friends? : For Fringe? I'd recommend The Three Times She Knocked. On Broadway, The Book of Mormon or Jerusalem. What’s up next? : Good question. Not entirely sure other than going back to college. I'm directing an original musical in the fall so that should be exciting!